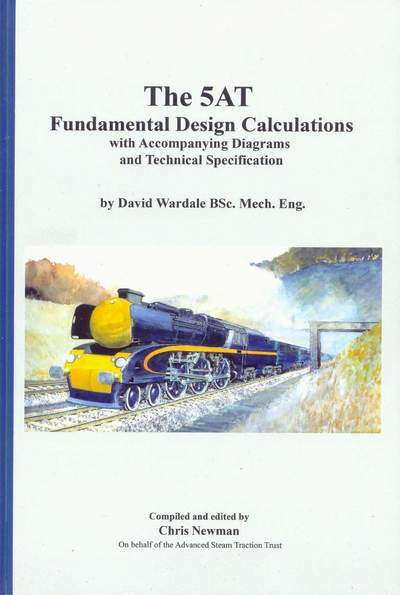 The 5AT Fundamental Design Calculations with Accompanying Diagrams and Technical Specification by Davie Wardale BSc. Mech. Eng. The 5AT (Class 5 Advanced Technology) steam locomotive was the brainchild of David Wardale, a British railway engineer who, in the late 1970s and early 1980s, made his name and reputation on South African Railways where he modified two locomotives: Class 19D 4-8-2 No 2644 and more famously Class 25 4-8-4 No 3450 which became the sole representative of Class 26, better known as "The Red Devil". In undertaking these modifications, Wardale put into practice the principles of "modern steam" developed by the Argentinean engineer Livio Dante Porta. In the concluding chapter of his iconic book "The Red Devil and Other Tales from the Age of Steam", Wardale speculated on what a "modernised" version of the humble BR Standard Class 5 4-6-0 might have been capable of delivering in terms of power and performance. It was his predictions for the performance of such a locomotive (as transcribed into this publication) that inspired the steam enthusiasts who, in 2002, formed the 5AT Project team. Whilst the 5AT Project ultimately failed in its aim of building a 5AT locomotive, it left an important legacy in the form of a complete set of Fundamental Design Calculations as undertaken by Wardale. These firmly established the remarkable performance that the 5AT would have delivered, and the requirements to be adopted in its detail design. This publication presents those calculations for the guidance of engineers, present and future, seeking to improve the performance, efficiency, reliability and/or economy of steam locomotives of any size and shape.